In my neurological practice, fortunately most of my patients with spine complaints leave the office with a prescription for conservative treatments rather than surgery. These can include: physiotherapy, traction, massage, ultrasound, injections and chiropractic therapy – all designed to relieve pain, recondition the body and restore posture and quality of life. Up until 2004, many of my patients also routinely received prescriptions for a non-steroidal anti-inflammatory drug (NSAID) pain medication. But that all changed after the after my own first-hand experience and some troubling news reports that same year. At about the same time, a group of newer NSAIDs came on the market that were designed to cause less stomach problems. These were called COX- 2 NSAIDs and seemed like a better alternative for me and my patients. However, some of these newer medications also were to show problems and side effects. During a clinical study, one of these COX-2 NSAID, Vioxx® (rofecoxib) was found to be associated with an increased occurrence of serious cardiovascular events, including myocardial infarct (MI) and strokes. On September 30, 2004, the FDA acknowledged the voluntary withdrawal of Vioxx® – a decision that ensured that the use of any NSAIDs must include a consideration of their side effects and long-term risks. Now, where did this leave me – and my patients? After my own negative experiences with NSAIDs side-effects, and following the Vioxx scare, I was determined to find a better alternative. My goal was to find a something that reduced inflammation-induced pain while avoiding the side effects associated with prolonged consumption of NSAIDs. 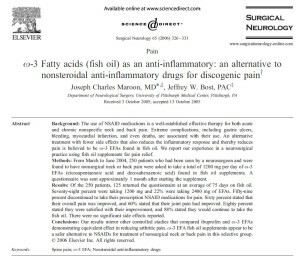 I began my search for replacement treatments and soon found several hundred peer-reviewed journal articles in scientific medical journals that reported on the use of Omega-3 (O3) essential fatty acids (EFAs) for a host of inflammation-related conditions. 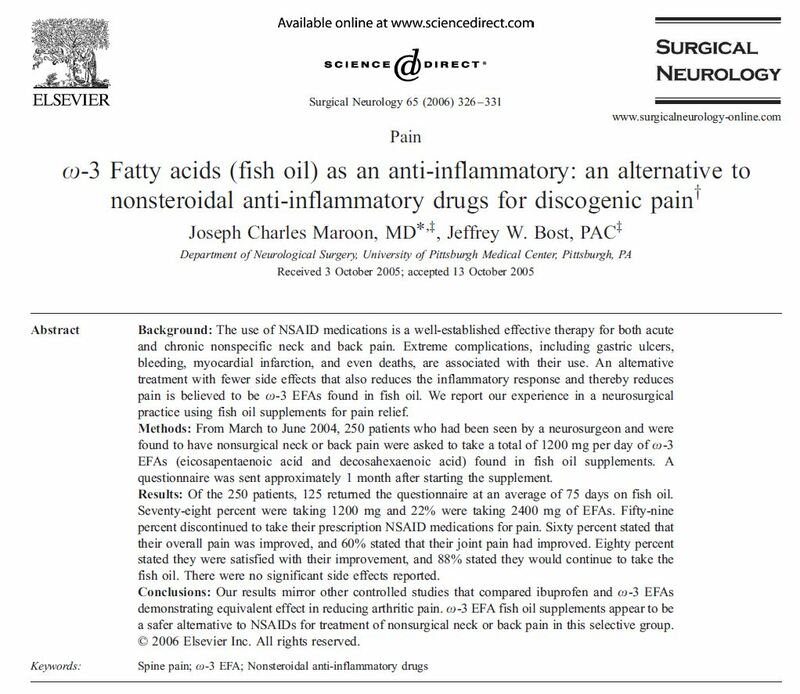 These fatty acids were proven to block the inflammatory response in a similar, but safer, way than their NSAID counterpart. Long-chain omega-3 fatty acids (eicosapentaenoic acid (EPA) and docosahexaenoic acid (DHA)). These O3′s are most bioactive, and are found in the fatty layers of cold-water fish and shellfish, to a lesser extend in some types of algae and in dietary supplements. O3′s are known to reduce cellular inflammation in humans. Short-chain omega-3 fatty acids (alpha-linolenic acid (ALA)). This O3 is typically found in plant-based food, such as flaxseed and English walnuts. Although beneficial, ALA is more difficult to to consume in the amounts needed to reduce inflammation compared to long-chain O3′s. Some foods are fortified with O3 fatty acids as well, but it is difficult to obtain adequate amounts of O3’s through your diet. I began to take O3 as a supplement and found similar joint pain relief as the NSAIDs. I now recommend to my patients to increase their dietary intake of O3’s and consider using fish oil dietary supplements. In addition to reducing inflammation and arthritic-like joint pain they have benefits to the heart and vascular system, including improving lipid levels. I personally began to take 2 grams of mixed DHA and EPA fish oil supplements. After 2 months, I had no further knee pain, was able to train again and, most notably, had no further stomach problems. In 2005, I conducted my first research study on fish oil supplements. I surveyed 125 of my non-surgical spine pain patients who I had also recommended to take O3 fish oil supplements. The survey showed a surprising number – 60% had obtained significant spine pain relief and almost the same amount – 59% — were able to stop taking NSAID pain medications and rely solely upon O3 supplements for pain relief. I published these results in Surgical Neurology, which prompted an editorial from the senior editor to encourage more neurosurgeons to learn about alternative treatments. 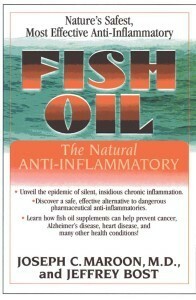 In 2006, I wrote about the benefits of fish oil in my book, Fish Oil: The Natural Ant-Inflammatory (Basic Health Publications, 2006). I continued to use O3 supplements as the first line of treatment for my patients with non-surgical spine pain. They can have tremendously positive benefit and can be taken for a lifetime. As with any supplement, I urge my patients to take a high quality pharmaceutical grade product. To date, the vast majority of my patients are very happy and highly compliant with these supplements. PLEASE NOTE: I advise caution when patients are taking blood thinners, as fish oil may accentuate the effect on bleeding. This information has not been evaluated or approved by the FDA. Please seek out your physician for medical advise.